Immigrants are withdrawing their children from health care and turning down food stamps as the Trump administration considers penalizing those who use public benefits — even if they’re legally in the U.S.
A hotel housekeeper with a working adult son, Hudith received food stamps that weren’t worth a lot — about $50 a month. But she was nervous. Though she was entitled to food stamps as a legal permanent resident from Mexico, and her three children were all born in the U.S., she heard from a friend that getting the benefit could be counted against her if she applied for citizenship. And she was planning to do just that. “I just don’t want to run the risk,” said the Western Washington resident, who asked that she not be identified by her full name. Strapped for funds, she sent two nephews then living with her to another aunt, and she uses food banks to supplement what she can afford. A new wave of fear is running through immigrant communities. So far, the Trump administration has adopted policies cracking down on those living here illegally. Now, it is turning its attention to immigrants here legally who it contends are a drain on taxpayer money. According to leaked documents, the Department of Homeland Security plans to propose a rule making it harder for some immigrants to stay here if they or family members have used any of a wide array of public benefits, including food stamps, Medicaid, subsidized insurance through the Affordable Care Act, support for pregnant women and new mothers, housing vouchers and the earned income tax credit. Immigrants enrolled in such programs — even for children who are U.S. citizens — would be deemed a “public charge.” Currently, such a determination applies to immigrants who use only two benefits: cash assistance such as welfare, and subsidies for long-term institutional care. An analysis by the nonpartisan Migration Policy Institute, using census data on people enrolled in four major federal programs, estimates the number of noncitizens who could be determined a public charge would rise from 3 percent to at least 47 percent nationally. In Washington, at least 244,800 people could be affected, according to a state-by-state breakdown. Nothing is final, not even the administration’s proposal, and there is confusion about who could be penalized, and for using which benefit. A recent draft published in the media, for example, refers to people entering the country and applying for legal permanent residency — but not those who already have green cards and are seeking citizenship. The rule would only consider benefits received after it is enacted. Their use would be considered a “negative factor,” weighed along with all other aspects of a person’s case. “Unfortunately, I think some people are panicking,” said Sarah Sumadi, a senior manager of the advocacy group OneAmerica. 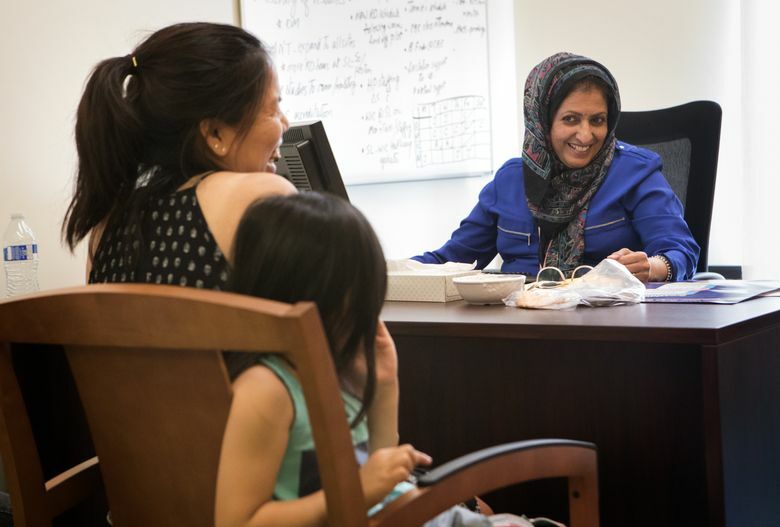 Immigrants, in some cases, are refusing benefits even if they are not likely to be affected, said Sumadi, who met Hudith recently at a legal clinic for citizenship-seekers and tried to persuade her, to no avail, to re-enroll in food stamps. Local health-care organizations say they are seeing parents withdraw their families from health insurance, medical care and the Women, Infants and Children (WIC) program, which provides nutrition counseling and food vouchers. “I started feeling it last year,” said Aliya Haq, nutrition-services supervisor at International Community Health Services, which sees many immigrants at medical clinics it operates in Seattle, Shoreline and Bellevue. “All of a sudden, a dad came to me and said, ‘please remove my family from these services.’” His wife and young son were in the WIC program, and also received primary care from Haq’s organization. She tried to get the dad to at least keep taking the child to the doctor. The toddler wasn’t thriving, Haq said. The dad said a friend of his had been deported, and he didn’t want to suffer the same fate. The administration’s draft proposal says factors relating to deportability will be inserted, leaving an open question as to whether a similar public-benefits test could be used to kick people out of the country, noted Mark Greenberg, senior fellow at the Migration Policy Institute. The WIC program at International Community Health Services has lost 155 patients in the past eight months, and Haq said she suspects fear is a driving factor. Outreach workers at the organization, who help people sign up for Medicaid and other subsidized health insurance, are getting some immigrants calling in to cancel, or saying they don’t want to enroll even if they qualify. Neighborcare Health, HealthPoint and Public Health – Seattle & King County said they have had similar experiences. “The big concern we have is that the most vulnerable populations are going to forgo getting necessary services,” said Jen DeYoung, Public Health deputy policy director. That, she added, could lead to less prenatal care for women, higher rates of infant mortality, people waiting until there’s a crisis to get medical care and increased use of high-cost emergency rooms. Gov. Jay Inslee and Seattle Mayor Jenny Durkan have both written letters to the federal government voicing alarm. “More than half of all immigrant households use one or more welfare program, driving the federal debt and deficit and unfairly taking benefits away from vulnerable U.S. citizens and communities. Noncitizen public benefit usage is deeply unfair to U.S. taxpayers,” the statement said. Unlike immigration policy changes President Donald Trump has enacted by executive order, like the travel ban, a rule change is a process that typically involves a 30- to 60-day comment period.